These days it seems the world is full of scary things, the most recent being the super-storm that just slammed the East Coast. I have relatives who can remember when the Hurricane of 1938 hit New York. Back then meteorologists had no idea what they were dealing with. And while technology and weather science has advanced greatly since then, the experience of living through a hurricane–and the “living through” part is the best case scenario–is as traumatic as ever. When it comes to instilling shock, awe, and abject terror, Nature pretty much trumps anything man-made. Talking of which, today is Halloween. Under present circumstances, it might seem a bit . . . quaint to be scared of things like bats, witches, ghosts, and vampires. On the other hand, maybe a little make-believe scary is just what we need at times, to distract us from the all too real scary confronting us on television, the internet, or in newspaper headlines. I loved Halloween as a child–dressing up as someone or something else, going trick or treating (and when you’re a little kid, yeah, it’s all about the candy), and the deliciously eerie experience of being out at night, often way past my bedtime, and seeing the neighborhood houses decorated for the occasion. Jack o’ lanterns, glowing skulls, tombstones on the lawns, cardboard cut-outs of witches, bats, and black cats in windows, ghostly shapes of white crepe paper hanging from the branches of trees. There was always at least one house on the block that went full out and got itself up as a haunted house, complete with flashing lights, spooky music, and recordings of thunder. As an adult, I have a slightly different perspective on Halloween, especially after several years of dealing with kids hyped up on excitement and way too much sugar. Namely, I’m openly glad that they get to enjoy themselves for the night–and secretly relieved that Halloween doesn’t last longer. All the same, I retain a nostalgic fondness for the holiday–and for a touch of make-believe scary. Personally, I prefer my scary laced with humor or whimsy. Straight-up horror just isn’t for me–if you ever managed to persuade me to see a horror film, I’d be the one peeking through my hands or getting up to use the bathroom or buy popcorn during the goriest parts. I don’t read Stephen King, who’s much too accomplished at what he does. The movie tie-in edition of Carrie, featuring a blood-drenched Sissy Spacek on the cover, was responsible for at least one nightmare when I was young and impressionable. Ditto for the cover of Frank DeFelitta’s reincarnation horror novel, Audrey Rose (it was the girl’s crazy eyes that creeped me out, seriously). So when I want a taste of make-believe scary, I go for things like The Addams Family movies (Anjelica Huston and Raul Julia are Morticia and Gomez for me, and Christina Ricci is a pitch-perfect Wednesday). Or even Charles Addams’ original cartoons of the family. And for years It’s the Great Pumpkin, Charlie Brown was a viewing staple in our house. And the Chuck Jones adaptations of Kipling’s Jungle Book stories, while not seasonal, were wonderfully dark, atmospheric, and–in the case of Rikki-Tikki-Tavi–spine-tingling. Nag, Nagaina, and Krait were as frightening as any human villain–possibly more so. More recently, The Nightmare Before Christmas has become an occasional favorite, though one could argue indefinitely as to whether it should be considered a Halloween or a Christmas film. 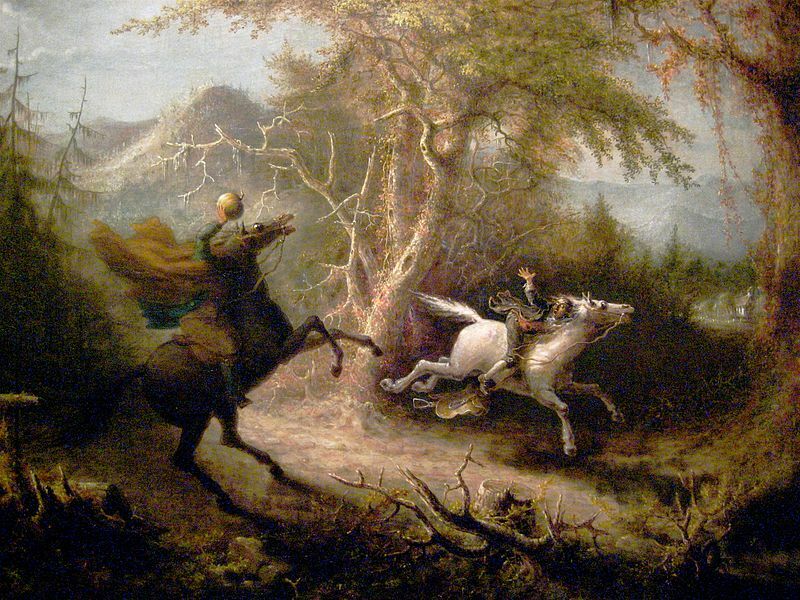 When it comes to scary stories with humorous undertones, it’s hard to beat Washington Irving’s The Legend of Sleepy Hollow, which inspired the above painting by John Quidor (1858). And there was a collection of delightfully macabre poems, Shrieks at Midnight, that I would frequently check out from the library, even committing some of the poems to memory. Delightfully macabre also describes the poetry and illustrations of the late Edward Gorey (even his surname is perfect!). So, dear readers–or anyone else who happens to be stopping by, what are some of your favorite things about Halloween? Do you prefer your scary straight-up or played for laughs? I’d be delighted to hear from you. Moreover, from now until its release date in December, I will be giving away an ARC of my (non-scary!) debut novel Waltz with a Stranger on a weekly basis. This week’s winner will be randomly chosen from among the commenters on this post. But tonight, with the book more than 80% complete, I feel I can break silence and share a few details. Like the cover. 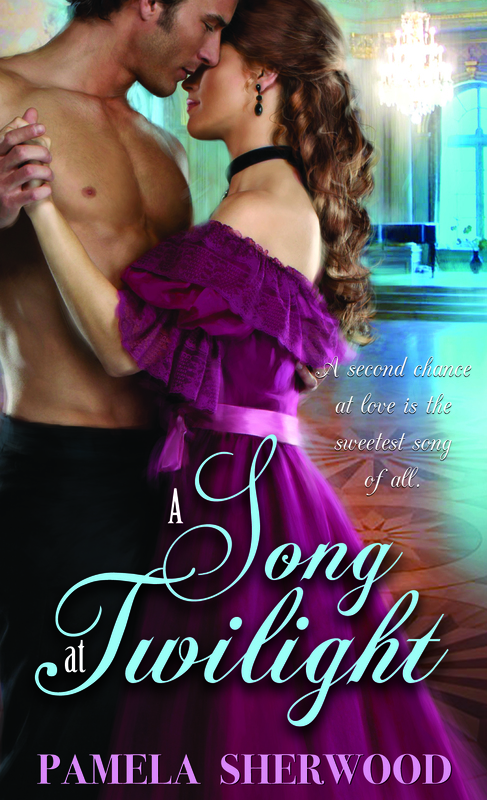 So, here’s a peek at my second book, A Song at Twilight, to be published sometime in 2013, more details–plot, characters, conflict, etc.–to follow. Generally, authors don’t have much control over what ends up on the cover of their book. And I have to admit, I’m not a huge fan of what are commonly called “mantitty” covers, especially when the situation doesn’t seem conducive to shirtlessness. But this one is growing on me, and I like enough of the other details–the couple’s pose, the setting, the colors, the plot-appropriate piano in the background–to be tolerant of Bare Chested Guy. Titles are another aspect over which authors don’t always have the final say. It’s probably a good idea not to get too attached to the first one you pick, especially if your editor is less enthusiastic about it. And to generate a few back-up titles you can live with, if that turns out to be the case. And sometimes the back-up title may turn out to be better or more appropriate that your original pick. My original title for this book was Unforgotten Song. Not a bad title, but I was asked to come up with something perhaps more evocative and romantic. I got to keep the title of my first book, Waltz with a Stranger, the general consensus being that it was a perfect fit for the story, so I didn’t grumble much, if at all. It was fun, in a way, to brainstorm alternate possibilities and see what I could come up with. I knew I wanted to retain a connection between music and love, as the heroine was a professional singer and the story set in the music world. So out came the poetry anthologies, the opera librettos, and my trusty copy of Bartlett’s Familiar Quotations. Comes Love’s old sweet song. A Song at Twilight–dreamy, evocative, authentic to the period, and appropriate for the characters. Who could ask for anything more? Fortunately, my editor loved it too, and gave it the green light. I’d like to think the shades of Laura and Anne might also approve–as long as Christine Stuart wasn’t anywhere about! So, readers, what titles have you found evocative or particularly well-suited? And writers, where do you find your inspiration for titles, and have you ever had to change one you were especially attached to?